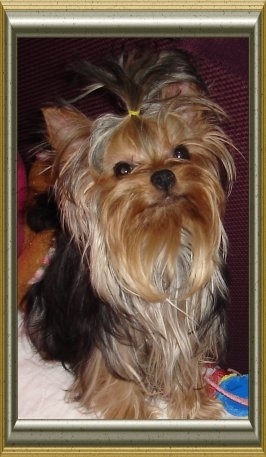 The Yorkshire Terrier's long, silken coat, a shimmering golden-tan and metallic blue, is supremely attractive, but a yorkie in full bloom requires more care and talent than the average owner may possess. The breeder should be able to help you with grooming issues and tips. The breeder should be able to help you choose the proper blow dryers, scissors, combs, brushes, shampoos, conditioners, etc. 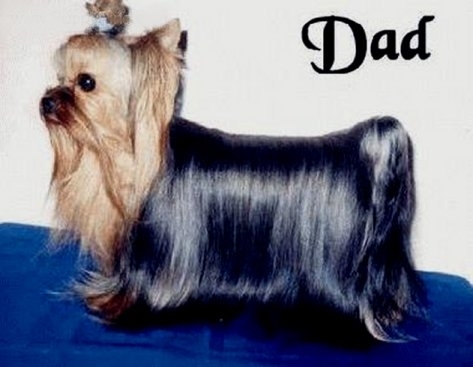 The Yorkshire Terrier requires daily brushing, grooming and weekly bathing. All dog breeds require a certain amount of grooming and care is necessary to keep dogs and puppies looking at their best. Grooming consists of not only brushing out the coat and bathing but also giving attention to the eyes, teeth, ears, feet and nails. A regular routine also ensures that any potential health problems are identified as quickly as possible, especially important in puppies and older Yorkshire Terrier dogs. Most Yorkie owners opt for the "puppy cut". This style is patterned after the schnauzer's body cut, which is 2 to 4 inches long all around. The head/face is cut in a circular pattern and left just long enough to put a short top knot or leave "spiked". The schnorkie cut is cute, stylish and vastly easier to maintain then the lovely to look at but not so delightful to care for "show coat". BUT many owners and yorkies love their grooming time together, because it is also a bonding time! So each owner and their yorkie must do what is best for them. Many More Grooming Tips Included in Your Nursery Package! The term 'Yorkie Teacup' is not recognized or endorsed by any of the major canine clubs or associations such as the AKC (American Kennel Club), the UKC (United Kennel Club) the CKC (Canadian Kennel Club) or the British KC ( Kennel Club ). It is a purely descriptive term for a Toy dog which may be smaller than the official size standard. 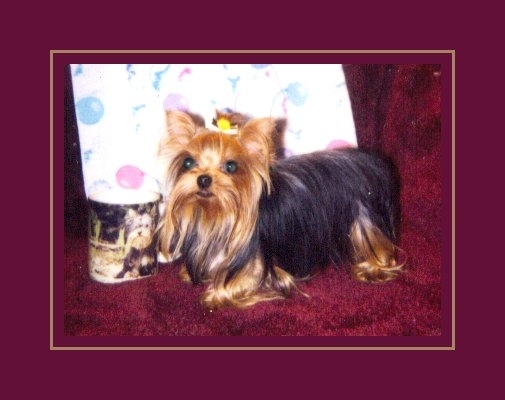 Whether the term 'Yorkie Teacup' is recognized or not people obviously like using it and regardless of varying Associations the phrases Yorkie Teacup Dog or Yorkie Teacup puppies are, no doubt, here to stay! The Teacup Dogs Agility Association is open to all dogs, regardless of breed or pedigree, measuring 17" or less, and who are at least 12 months of age. A Yorkshire Terrier holds the distinction of being the smallest dog in history. This matchbox-sized Yorkie, at the age of 2 years, stood only 2 1/2 inches at the shoulder!! He measured 3 3/4 inches from the tip of its nose to the root of its tail! He weighed only 4 OUNCES!!! His owner was Arthur Parples of Blackburn, Great Britain. This elfin dog died in 1945.